There was once a time when one had to travel miles and miles to sell his goods or even to buy some. Trading can be traced back to the very beginning when communication developed among people. Over time, e-commerce has developed in all aspects. Starting from the introduction of standardized currencies to introduction of banking, everything has added to the development of commerce. Today transactions are being carried out at lightning fast speeds, which was once nothing but a fiction. Internet was not the main interface for commerce till the 1990s. Thanks to the advancement of internet and ever-growing efficiency, it has become the primary interface for carrying out businesses and transactions thus giving rise to E-commerce. What Do You Understand By E-Commerce? E-Commerce is a basic economic activity involving trading or the buying and selling of goods. It is a business model which allows various firms and individuals to carry out transactions using an electronic interface, mainly the internet. 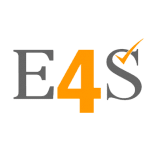 It accommodates buying and selling of any item over the Internet, electronic fund transfer, smart cards, and all other methods of doing business over the digital network. This is simply defined as E-commerce between companies. About 80% of E-commerce is of this type like Intel selling microprocessor to Lenovo, PepsiCo selling beverages Pizza Hut. It is commenced between companies and consumers, involves customers gathering information about purchasing physical goods or receiving products over an electronic network. Example: Dell selling its computers to you or me, it’s simply B2C. Consumer-to-consumer E-commerce or C2C is simply business between private individuals or consumers. Example: Many websites are there like Manish buying Car from Tanmay on eBay or selling the phone on OLX. B2G is mainly defined as business between companies and the public sector. It accredits to the applicability of the Internet for public procurement, licensing procedures, and other government-related operations Example: Business pay taxes, file reports, or sell goods and services to Government agencies. This is the part of e-Governance.The aims at, to provide good and effective services to each citizen. The Government tries to give the different facilities to the citizens through its different website. Information about the government departments, different welfare schemes, different application forms, to be used by the citizens, like filling online application for Passport are the examples of G2C. It is a business model that refers to the government giving services or information to the business organization. Such websites support auctions, tenders and application submission services for conducting business. To start an online business it is best to find a niche product that consumers have difficulty finding in malls or department stores. Also, think about the shipping which is needed to be considered. It provides a benefit to firms by providing them a place to establish themselves and improve their market position irrespective of their size and expand their global profit as well. More companies now try to entice consumers directly online, using tools such as digital coupons, social media marketing, and targeted advertisements. 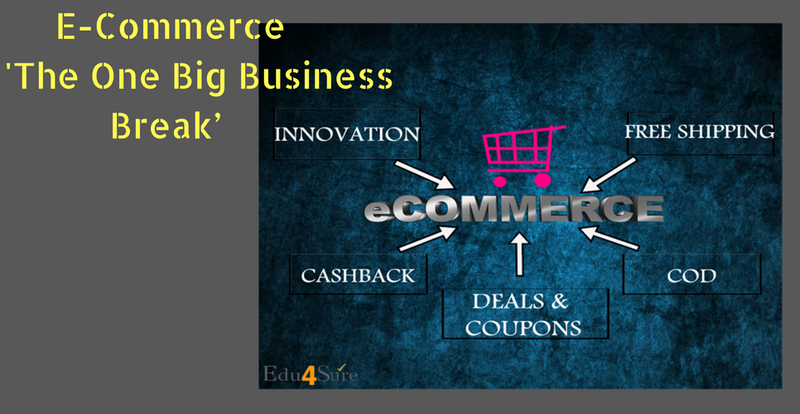 E-commerce is changing the face of business as never before due to the increased adequacy of the internet. Large corporations are using this platform to boost their growth. The power of e-commerce in improving trade can be explained by the following online article: “Dell Computers sells more than $14 million worth of computer equipment a day from its website. By taking their customer service department to the web Federal Express began saving $10,000 a day. The Internet provides businesses with the opportunity to sell their products to millions of people, 24 hours a day”- (Baxton, 1999). The most illustrious form of e-commerce or electronic commerce is online shopping, also known as business to consumer e-commerce (B2C), where customers can order different products which they then receive by courier or postal mail. There is a close analogy between a website that sells certain commodities and a store at the mall that also sells the same, here referred to as an online store. One of the discrepancies s between a retail store and an online store is that while the store has circumscribed hours of operation, an online store is a twenty-four hours a day and seven days a week business. The necessitated wait time for product shipping. 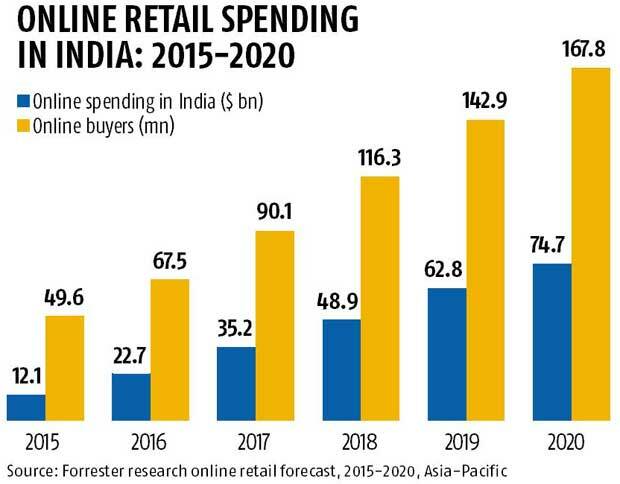 In India, e-commerce is still at infancy. The internet penetration in India is still very low as compared to other developed countries. Even then India is fast emerging as the largest country for registering domain names in the entire Asia-Pacific region. According to the latest dotcom index for the year up to February 2000, India occupies 11th place in it after the US. UK, Korea, Canada, France, Germany, Japan, China, Spain, and Italy. According to recent data, the number of buyers in India is expected to reach 41 million by 2016, representing some 27 percent of the total number of internet users in the country. In India, 9% of the country’s population has contributed their purchase via mobile phone within the past month, as of the fourth quarter of 2014. Another important aspect hindering the expansion of e-commerce in India is that it has been uneven, concentrated in just a few metropolitan cities, like Bangalore, Hyderabad, Mumbai, and Delhi. The common man living in rural areas of the country is unaware of it. In a nut-shell, there is humongous potential for e-commerce companies attributable to the growing internet user base and advancements in technology. How a company qualifies itself to meet these ultimatums will decide whether or not it succeeds. The road to creating a successful online store can be quite bumpy researching and understanding the guidelines required to properly implement an e-business plan is a compelling part to be successful with online store building. E-commerce can be a rewarding venture, but one cannot make money overnight. It is important to do a lot of research, ask questions, work hard and make on business decisions on facts learned from researching e-commerce.